Asphalt & Rubber was recently one of a few blogs, along with the usual suspects from the American media, to be invited out to Arizona for Yamaha’s press launch of the Super Ténéré adventure-tourer motorcycle (because we know Americans have no idea what to do with an accented “e”, think “tay-nay-ray” for pronunciation…or just cheat like us and say “ten-air-ray”). 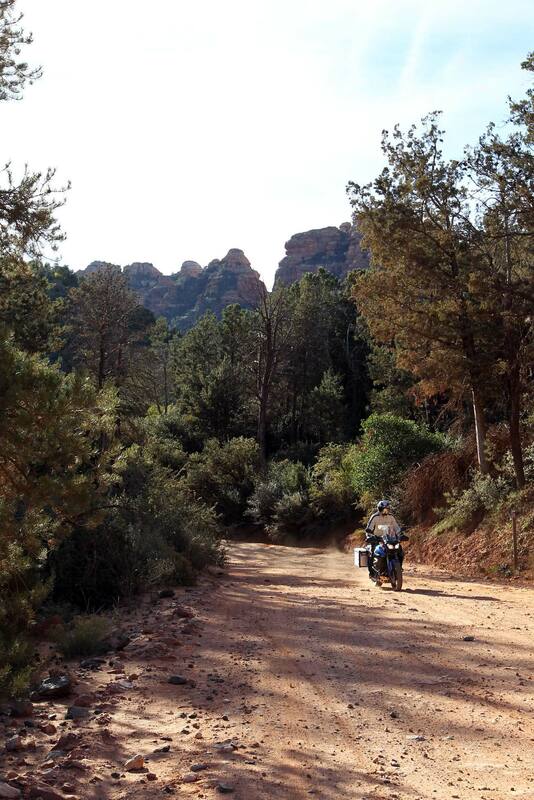 The earth is orange here in Arizona, and between the mesas and evergreen forests, Sedona makes for a picturesque setting, that’s away from the bustling metropolitans and city life. This serves our purpose well as its an ideal environment to show-off the 2012 Yamaha Super Ténéré against the desert’s beautiful backdrop and star-filled skies, but it also serves as the type of destination Super Ténéré owners would likely visit on Yamaha’s new motorcycle, putting us right in the shoes of the target customer. 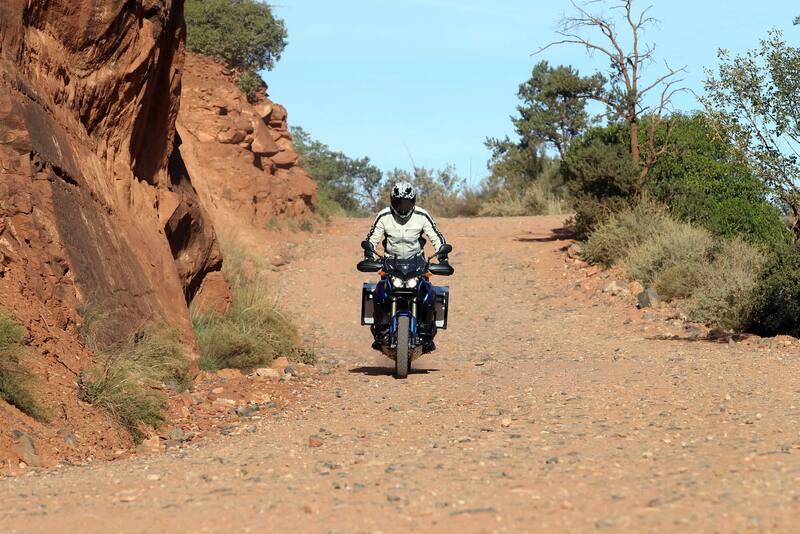 A market segment based around compromises, adventure-tourers sit somewhere between the juxtaposition of dirt and touring bikes. 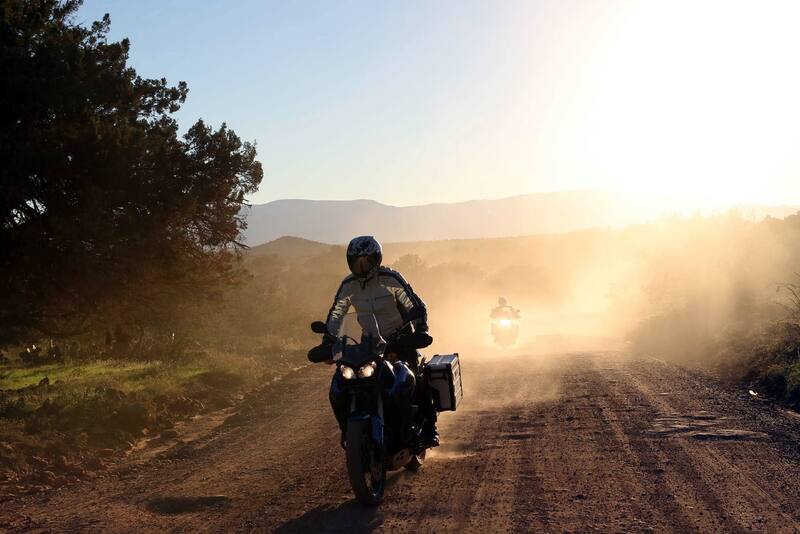 Based on the idea that the journey doesn’t end where the road does, the adventure-tourer market has taken over from the Harley-Davidson crowd as the next expression of freedom on the open road. 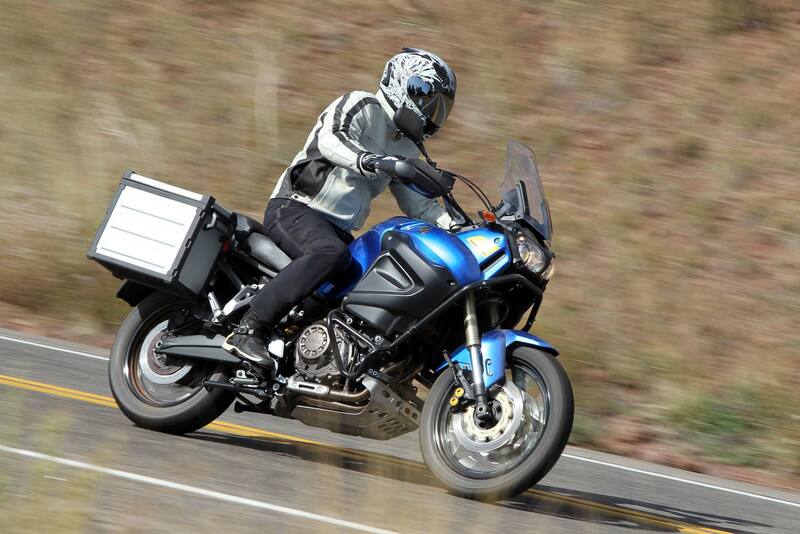 Essentially created by the BMW GS series, it is impossible to talk about adventure bikes without mentioning the GS, but other manufacturers as well have entered into this growing market, coming up with different ideas on what riders are looking for when they want to escape from the daily grind. 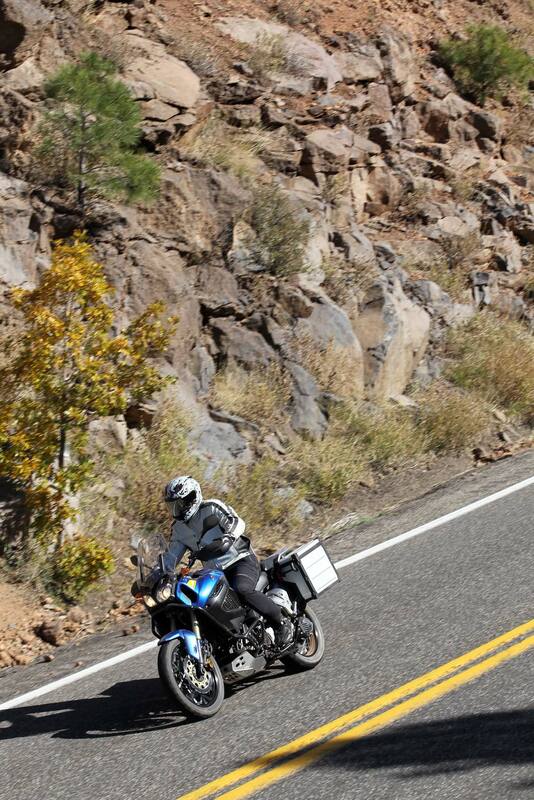 Built to ride both on and off the street, adventure bikes pose the unique problem of having to decide where to make the trade-offs between these two different purposes, and in this regard we find the 2012 Yamaha Super Ténéré, leaning more heavily to the street side of this equation than say the BMW R1200GS. 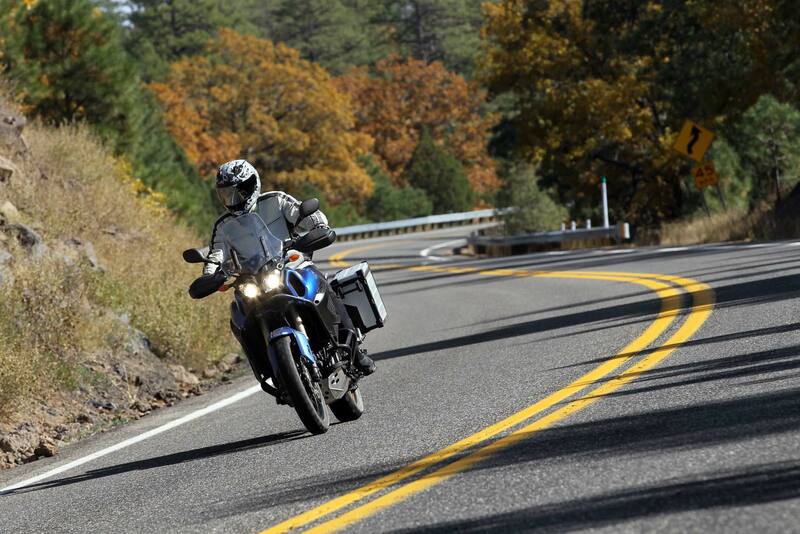 As a publication that centers around street bikes generally (hence the name Asphalt & Rubber), we too lean towards the street side of that equation, making the Yamaha Super Ténéré a strong congruency to what we look for in this motorcycle segment, and a bike we wouldn’t mind adding to our stable of daily riders and long-distance tourers. Approaching the 2012 Yamaha Super Ténéré for the first time it is clear that this is a motorcycle designed to soak up more than the occasional pothole. 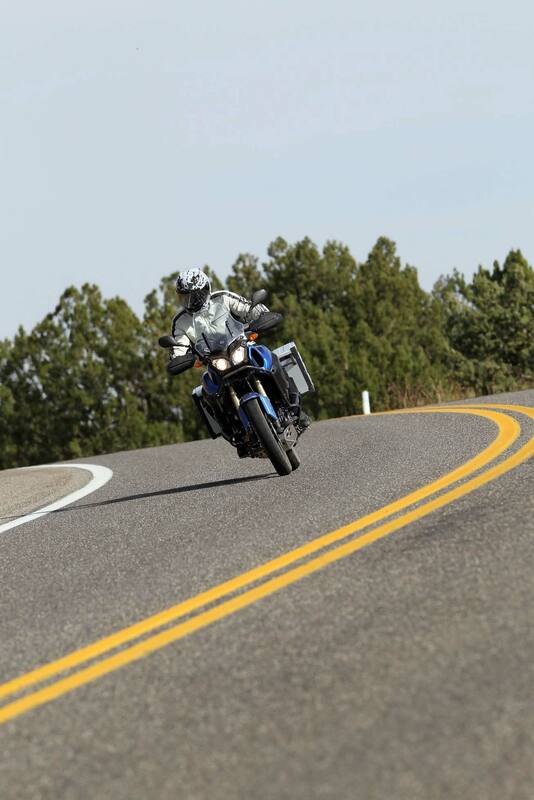 The Super T is tall with its 7.5” of fully-adjustable suspension front and back, and with the bike’s swept-back headlight and high-mounted radiator intakes, the Super T has a menacing look that only becomes more appealing over time (we prefer the blue color scheme over the black though). 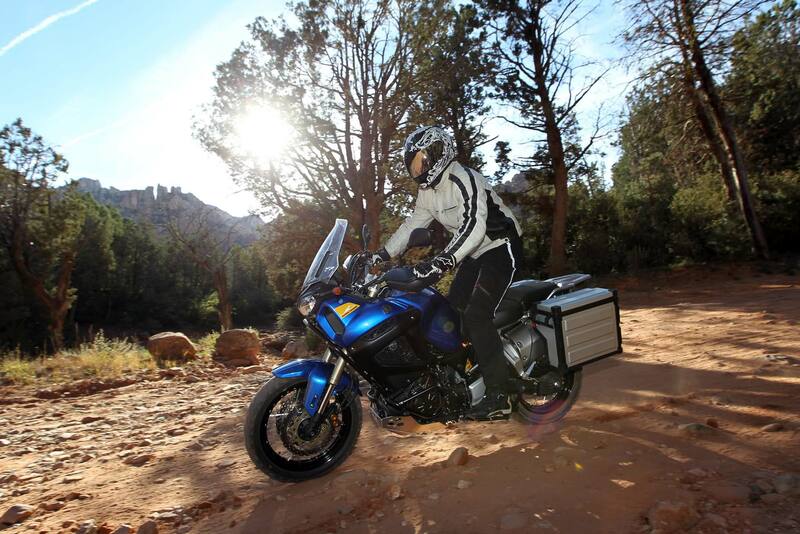 The first adventure-tourer to come from Japan, the Super Ténéré is what you would expect from Yamaha: well built and pragmatic. Japan has seemingly finally gotten on-board with one of the hottest motorcycle segments in recent years, and is using this opportunity to also enter into the OEM fray of electronic packages. 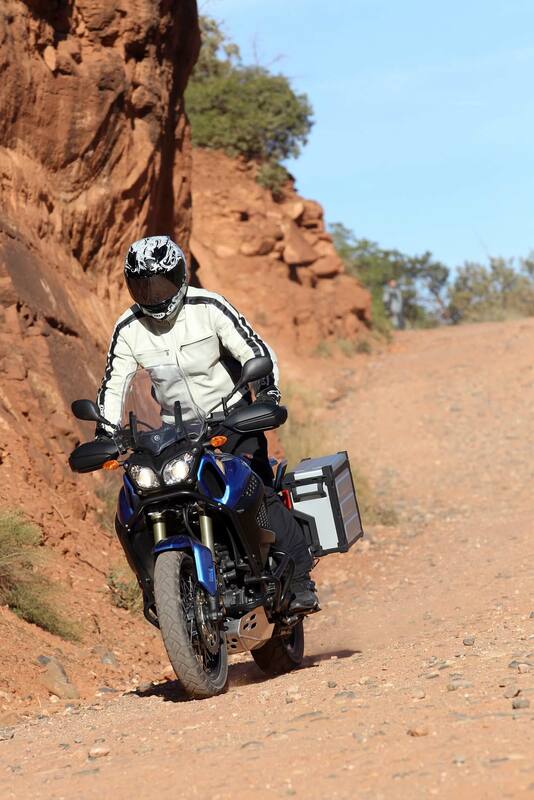 As such for the Super Ténéré, Yamaha has included advanced systems like: traction control, anti-lock brakes, unified brakes, dual-riding modes, and ride-by-wire throttle control. While these systems do their part to transform the 2012 Yamaha Super Ténéré from street to dirt duty, Yamaha has also adapted the Super T’s mechanical package to shine in both venues. 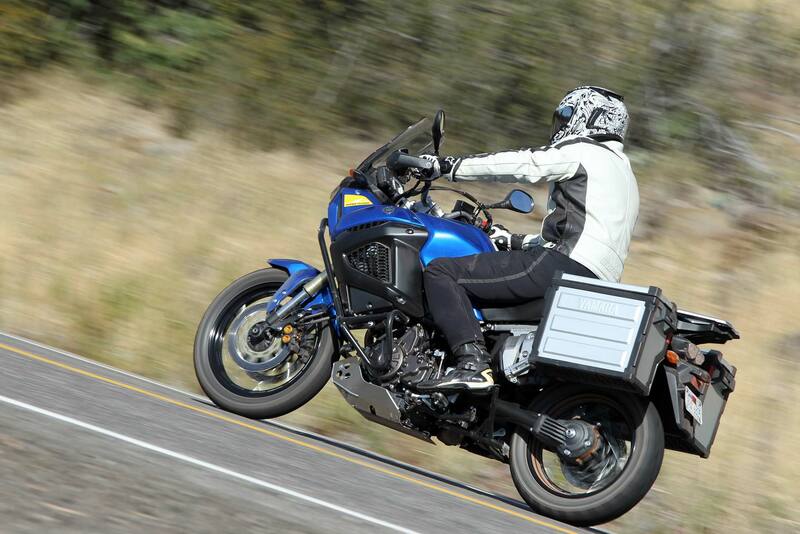 The first compromise in Yamaha’s adventure-tourer package is the bike’s wide-ratio gearbox. With the first three gears set closer together than the latter three, Yamaha has designed a gearbox that offers a rider the ability to finely control the bikes rev’s and power output while tracking at slow speeds around town and on mixed surface roads, and still stretch the legs on the Super T without winding up the engine to absurd levels. For bonus points Yamaha has made the Super Ténéré’s gearbox to shift like butter, resulting in clear and precise shifts. Something that’s noticeably absent on the street-oriented Ducati Multistrada 1200, the Yamaha Super Ténéré is more than at home anywhere in the rev range, including the 1,000-3,000 RPM band, making slow speed maneuvers effortless and stumble free. It really is hard to convey how important this aspect of the Super T is when traveling through slow-speed traffic or tackling technical dirt sections. In what would have been an exercise in clutch and throttle control on the Ducati’s over-square v-twin motor, the Super Ténéré’s longer stroke, 270° firing order, and superb fuel management allows for one to keep the bike in virtually any of the first three gears at slower speeds without stumbling, thus allowing the rider to focus on more important things like not falling off the side of a cliff for example. On the open road the Super Ténéré’s taller 4th, 5th, and 6th gears show greater variety in the rev/power range, which tailored well for our 200+ miles of highway touring. 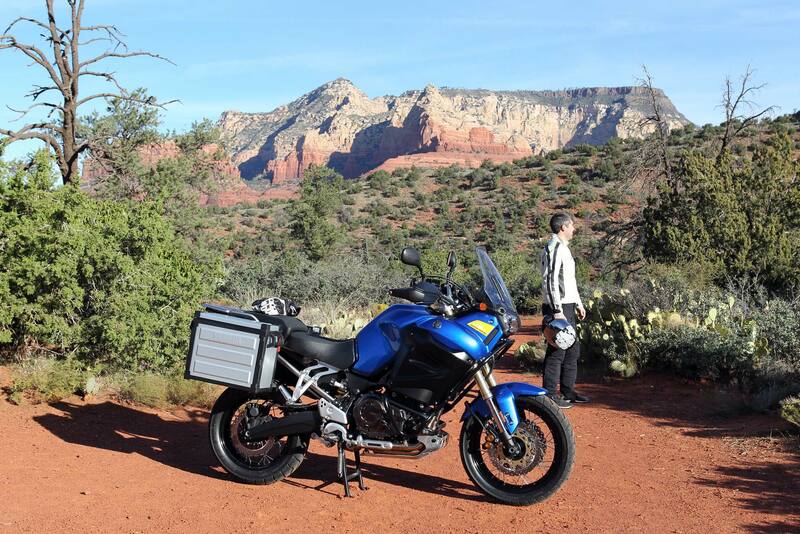 On the interstates of Arizona the Yamaha Super Ténéré shows its practical nature, as it leisurely sips fuel at a modest rate. About 100 miles into our trip, the fuel gauge shows only about 1/4 of the Yamaha Super Ténéré’s 6.07 gallon tank has been used. Cruising in the overdriven 6th gear, we were easily getting 60+ miles per gallon on the freeway, which means Super Ténéré owners will likely have to take a break well before the Super T needs to be refueled. This also means that the Yamaha Super Ténéré can stray far from established roads, before a would-be adventurer will have to think about refueling. 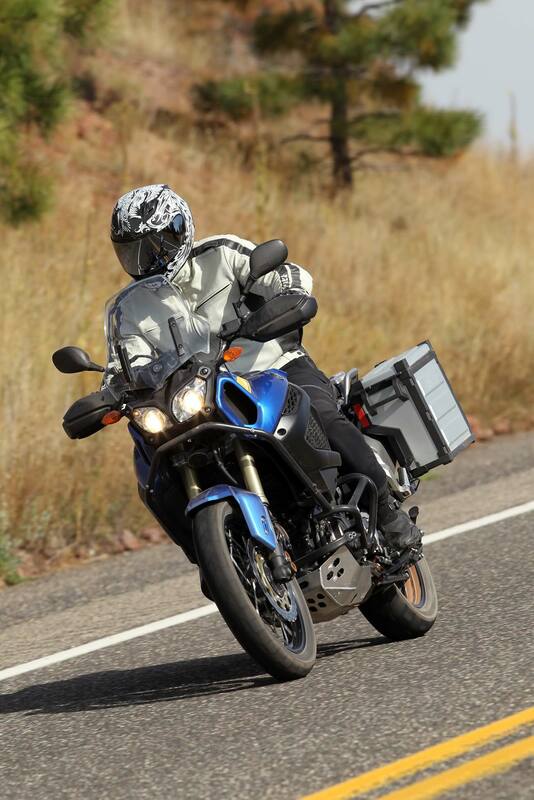 Rider fatigue won’t be much of an issue with the Yamaha Super Ténéré though, as there is more than ample room for riders over six feet tall, and the riding position leaves the body sitting predominating upright, as if seated in an office chair. The bars do leave you reaching slightly, which can fatigue the lower back, but even after doing a 200 mile ride, the thought of doing even more miles did not seem daunting to our well rested legs and body. The seat height can be adjusted by about an inch, with the seat in its tallest position allowing for a 32” inseam to flat foot the Super Ténéré just fine, while providing a natural bend with the feet on the pegs. Wind buffeting was average, with the stock windscreen providing some protection from the wind, but true tourers will want to look at Yamaha’s larger touring screen option, or the equivalent aftermarket option. 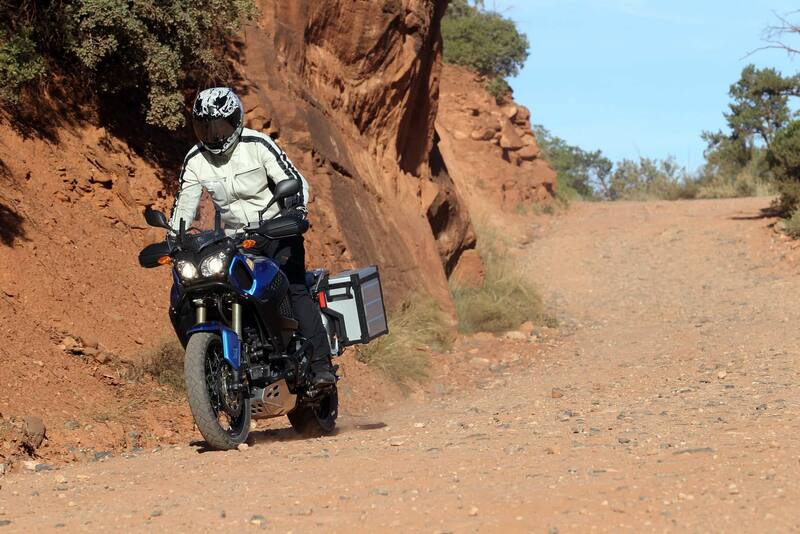 Also helping the Super Ténéré pass the miles more easily is Yamaha’s dual-mode engine maps. Selectable on-the-fly, the Yamaha Super Ténéré can switch between a “sport” and “touring” map, which sees the latter delivering a more blunted and subdued throttle delivery. In the dirt the touring mode made it less likely that the Super T would leave in a cloud of dust and rocks, but we found it just as easy to ride the bike off-road in either mode. 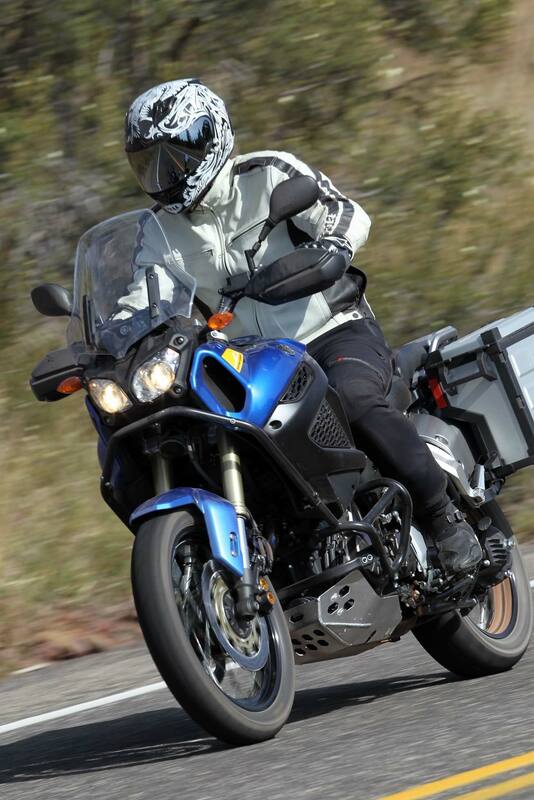 In the end, it comes down to rider preference and how much throttle response you want from the Super T…we happen to like the Super Ténéré in sport mode for most of our 300+ mile trip, but we that’s just sort of how well roll. 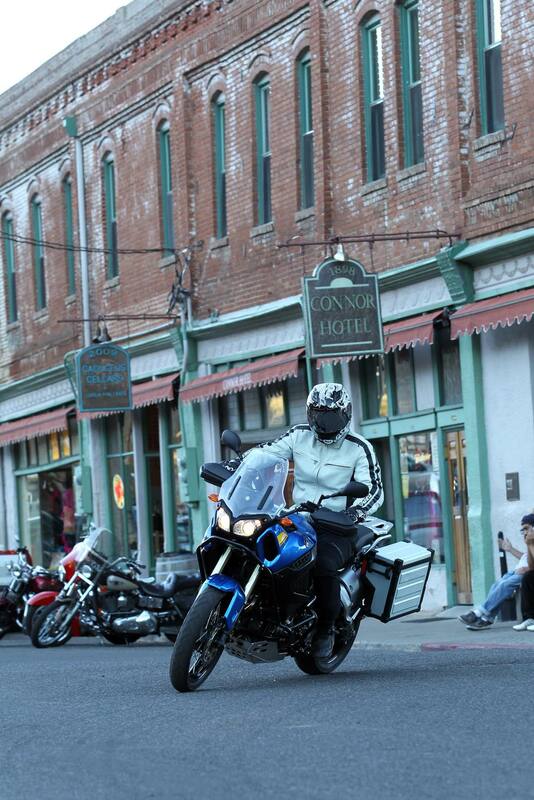 The 2012 Yamaha Super Ténéré is fitted with a parallel twin 1199cc motor that makes a modest 108hp (European Spec). This is certainly a far cry from the Ducati Multistrada 1200’s neck-snapping 150hp figure, but right on par with BMW’s 110hp R1200GS. 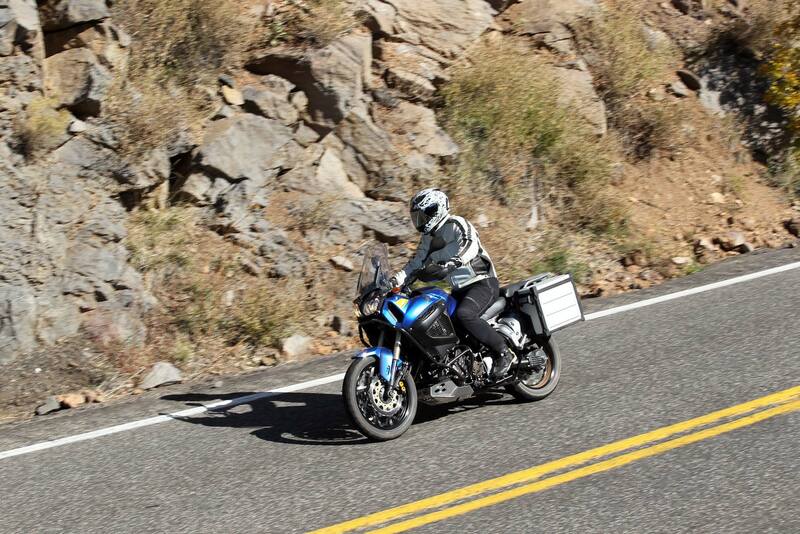 While it is important to note that we were riding nearly a mile above sea level, when passing traffic on the freeway, downshifting two gears was needed to make the pass in a brisk fashion, as the Super Ténéré’s chaste peak power showed itself when twisting the throttle and hoping for maximum velocity. 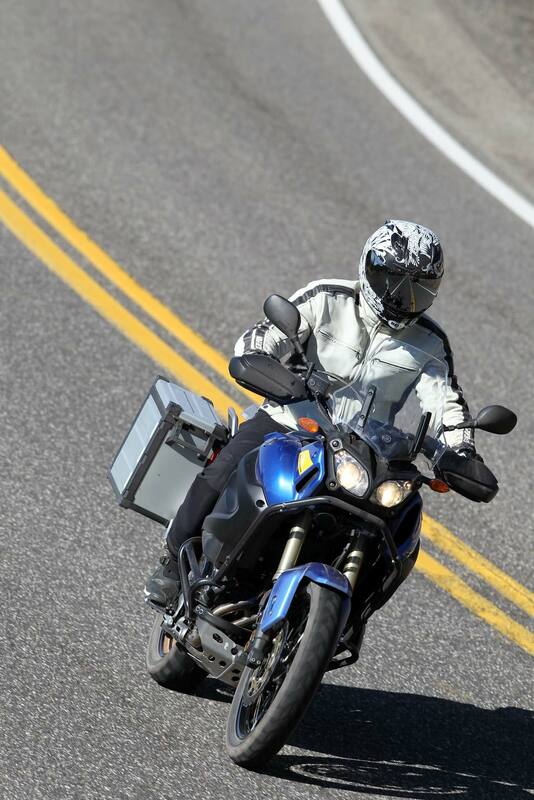 Once you get to triple digit speeds though, the Yamaha Super Ténéré feels quite at home blasting down the road, and is very stable at this pace, especially when the suspension has been stiffened with a few twists on the pre-load. 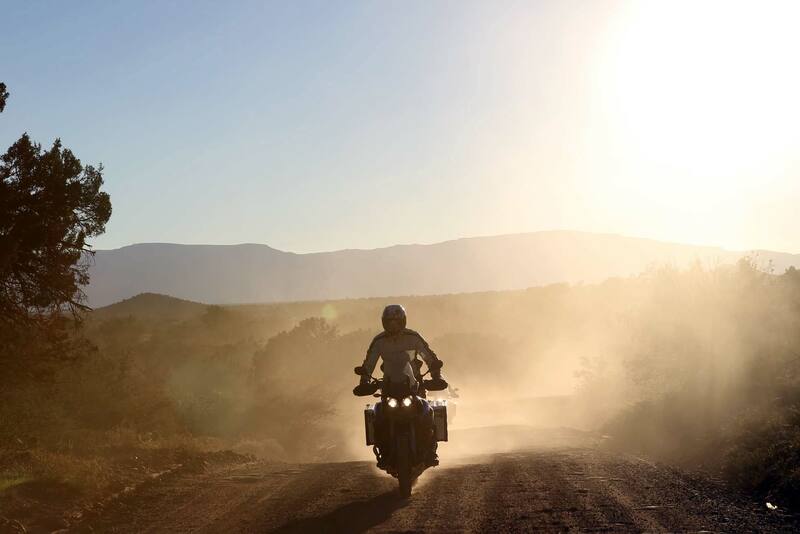 With a 270° piston firing order, the Super Ténéré’s power pulses comes on in spurts, allowing the rear wheel to hook up easily with the terrain, which in-turn provides great rider feel and tire traction. As you’d expect, the Yamaha Super Ténéré’s suspension is set out of the box to be supple, as it not only needs to absorb potted city streets, but rutted dirt roads alike. The trade-off for this comfort though is a noticeably vague front-end when blasting through the canyons. However stiffening the suspension is a simple matter of adding on some more pre-load, which is easily accessible, hopping back on the bike, and grinning ear-to-ear (we didn’t bother changing the compression and rebound on the side of the road, but it can be accessed just as easily). 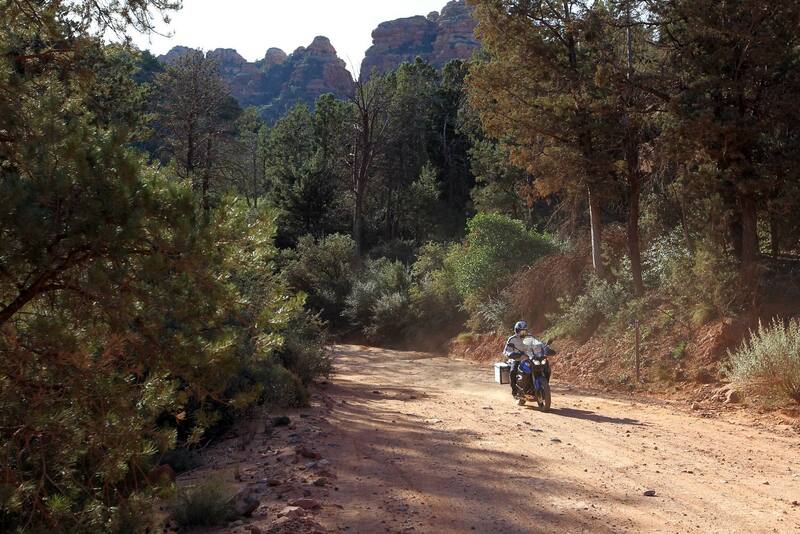 Taking to the dirt roads nestled in the mountains of Sedona, the 2012 Yamaha Super Ténéré is just as at home as it is on the street, and it is here where Yamaha’s electronics package really shines. 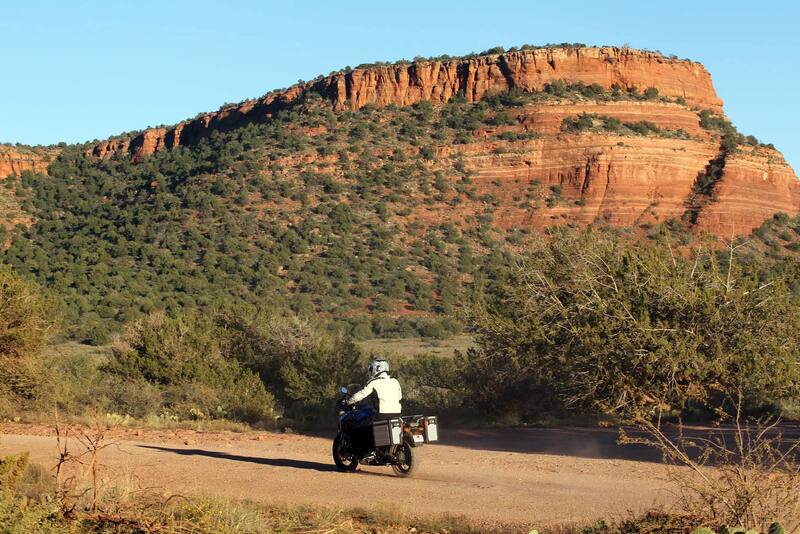 Despite the Super T’s 575 lbs curb weight, the low center of gravity and wide handlebars make the Super Ténéré easy to control and balance through rock covered trails and fire roads alike. Realizing that not every Super Ténéré owner will have been raised on dirt bikes, Yamaha’s traction control system manages ambitious throttle twists and poorly picked lines through fallen rocks quite well (there were more than a few of these “tests” in our ride with the Super Ténéré…mostly rider induced). 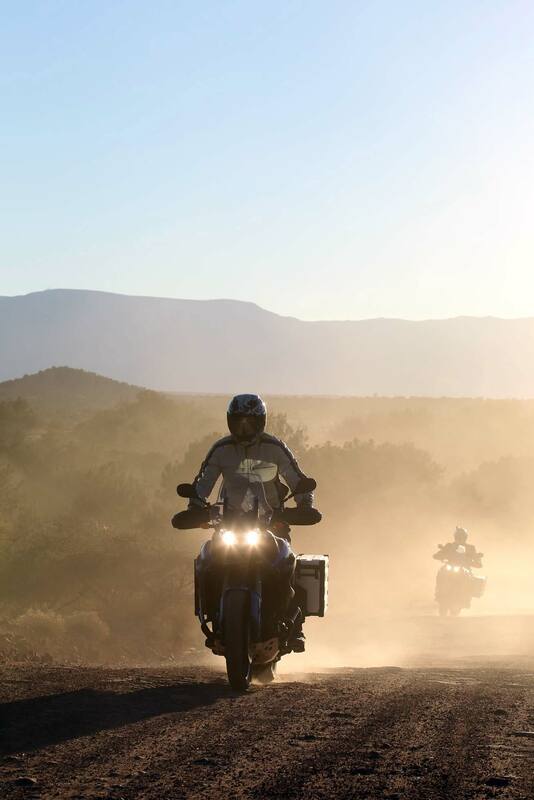 With three settings for the traction control, experienced dirt riders will want to immediately move on from the TC1 setting, which sees Yamaha’s traction control system intervene generously as you navigate uncertain terrain. For novice dirt riders though this setting can be godsend, as one simply has to “twist it and grip it” (trademark pending) as the Yamaha Super Ténéré and its traction control system figures out the best way to get you up and over whatever obstacle you laid before it. TC2 takes the traction control down a few pegs, intervening only during the more necessary instances, allowing the Super Ténéré to fishtail under power and show more character on the dirt than under TC1. 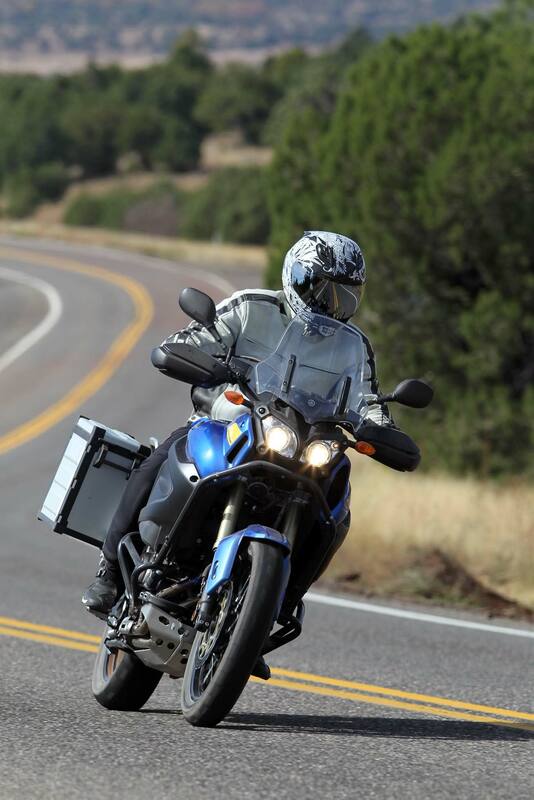 Lastly Yamaha allows for the traction control system to be completely disabled, letting riders choose their own adventure in its most pure form. In order to keep riders from unsuspectingly being without the traction control system’s benefits, the Yamaha Super Ténéré reverts back to TC1 once the motorcycle has been turned off, meaning a rider will have to reset the traction control settings before starting the Super T again. Putting this level of control in the rider’s hands seems to be the best solution to the problem of making a traction control system that appeals to all levels of riders and their varying requirements from the Super Ténéré, so it is interesting that Yamaha elected to omit an on/off option for Super T’s anti-lock brakes. Surely to be a bone of contention, and even a deal-breaker for the die hard off-roaders, Yamaha says that the ABS is necessary to keep the Super Ténéré’s dual 310mm front-brakes from locking up the front wheel immediately when the brakes are applied. That’s a fancy way of saying a bunch of lawyers took one look at the Super Ténéré and saw millions of dollars in product liability if ABS wasn’t added as a full-time feature. Judging from how well the Yamaha Super Ténéré brakes work, we’d tend to agree, but then again this author is well versed in product liability. 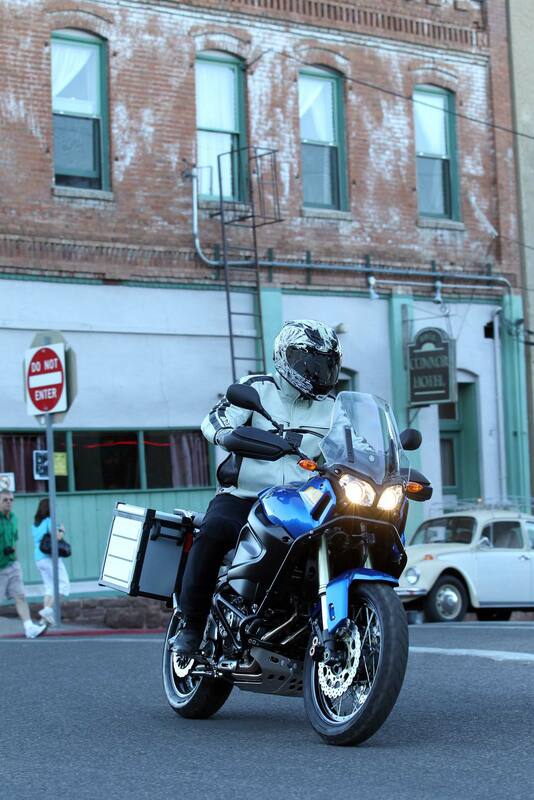 When it comes to the great debate of ABS on motorcycles, we sit firmly on the side of the technology (we are big geeks after al), which has been saving lives in cars for decades now. Applying a massively generous amount of front and rear brakes on a dusty and gravel filled section of trail, the Super Ténéré did not continue to roll on down the road like some ABS proponents like to berate the technology for when on slippery surfaces. Instead Yamaha has seemingly found a good balance between keeping the front wheel under control, while allowing the rear to lock up more and slow the bike, as you would naturally do on a dirt bike. 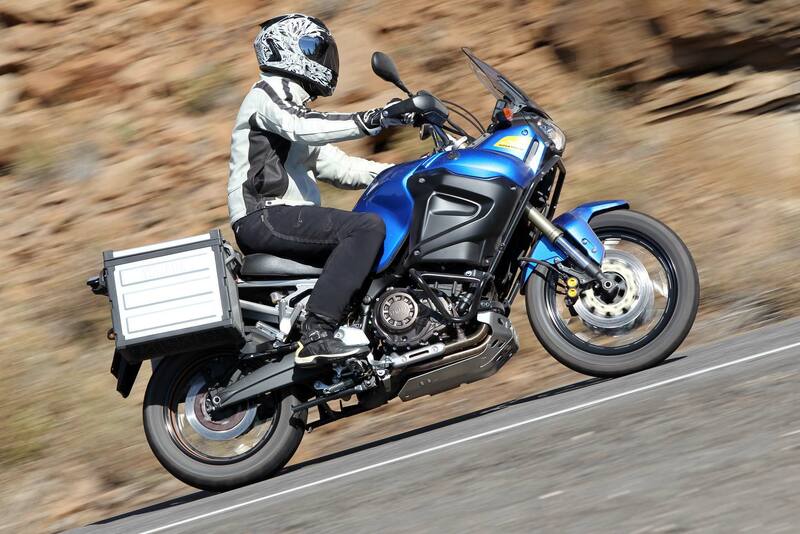 Working in tandem with the traction control system, the Super Ténéré will shift side-to-side slightly as the rear gives a mild fishtail, but the bike remains upright and in control, while the braking distance remains manageably short. It will be a few more years before the anti-ABS debate finally dies out, but it’s clear from the Yamaha Super Ténéré that this technology can successfully be used off-road, and for better or worse this is going to be the standard on motorcycles in the coming model years. Slightly less controversial is Yamaha’s Unified Braking System (UBS), which applies rear brake pressure when only the front brake is applied by the rider. If the rear brake pedal is pressed before the front brakes are applied, then the UBS is over-ridden, meaning riders can control the rear wheel if they want. For lazy street riders who rarely touch the rear brake pedal (*cough), this feature will add more braking force to the Super Ténéré via the rear tire, which has the added benefit of keeping the rear of the motorcycle under greater load during hard braking, and the bike diving under the long travel on the front suspension. To truly go off-road with the 2010 Yamaha Super Ténéré, buyers will have to invest in Yamaha’s X-Country Terrain Package, which sees a black frame engine guard, aluminum skid plate, and headlight protector added to the bike. 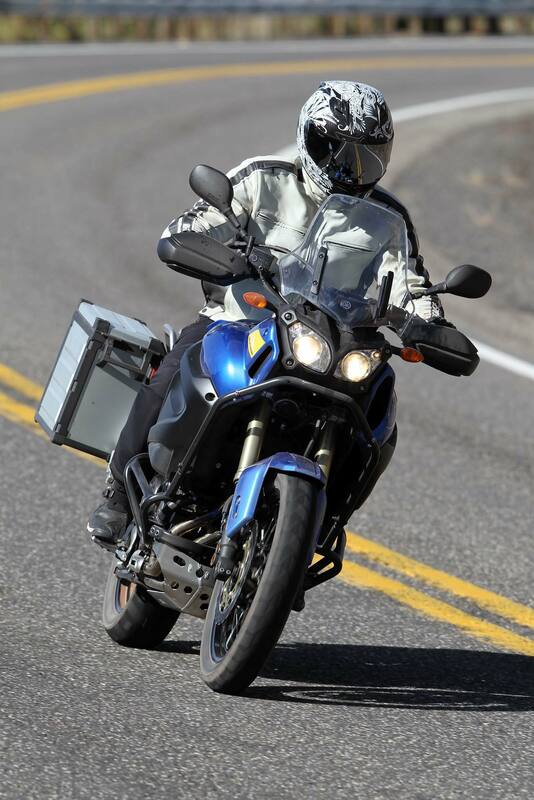 This will tack on another $750 to the Super Ténéré’s base price of $13,900, and as tested with the 61-liter aluminum saddlebags, our Yamaha Super Ténéré cost $15,500. 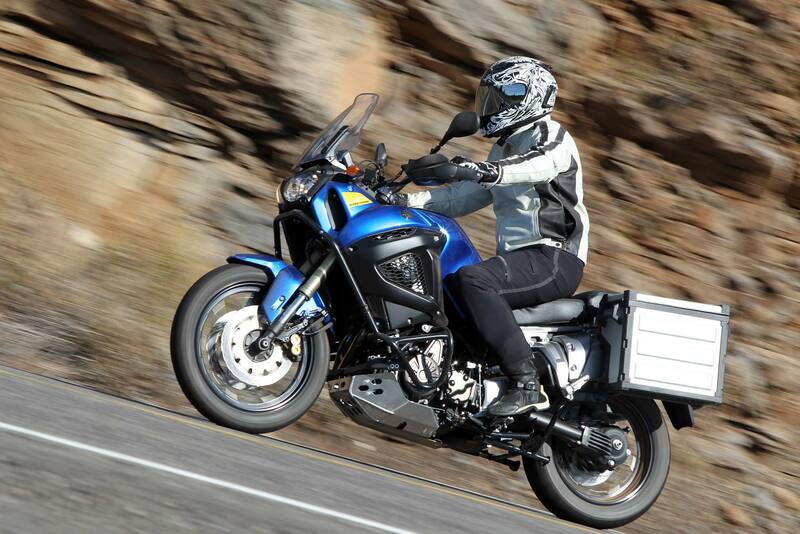 Even with these add-ons, the Super Ténéré prices very favorably against the BMW R1200GS, which costs well over $17,000 with similar amenities. While the BMW, Ducati, and Yamaha Super Ténéré aim to take different bites out of the same piece of pie, Yamaha has clearly targeted its competition and aimed to provide the same type of experience for considerably less money. With valve adjustments every 24,400 miles, the Super Ténéré also looks to be an inexpensive long-term purchase, and this is where Yamaha’s adventure bike offering really shines: the maximum bang, for the minimum buck. 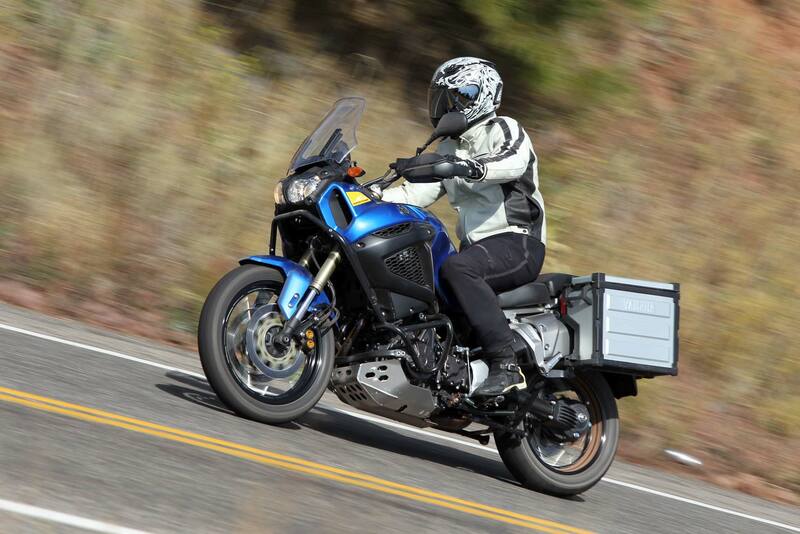 While we would have like to see Yamaha introduce more on-street grunt for the Super Ténéré, and maybe introduce a reduction in horsepower to the 100hp figure in a “enduro” map like on the Ducati Multistrada 1200, we wouldn’t have traded that power increase for the Yamaha’s low-rev tractability. Also knowing that such a system, along with electronically adjustable suspension, would greatly increase the Super T’s modest price tag (the Ducati Multistrada 1200 S will hit your pocketbook for nearly $20,000), Yamaha seems to have maintained a strong balance between features, performance, and user cost. 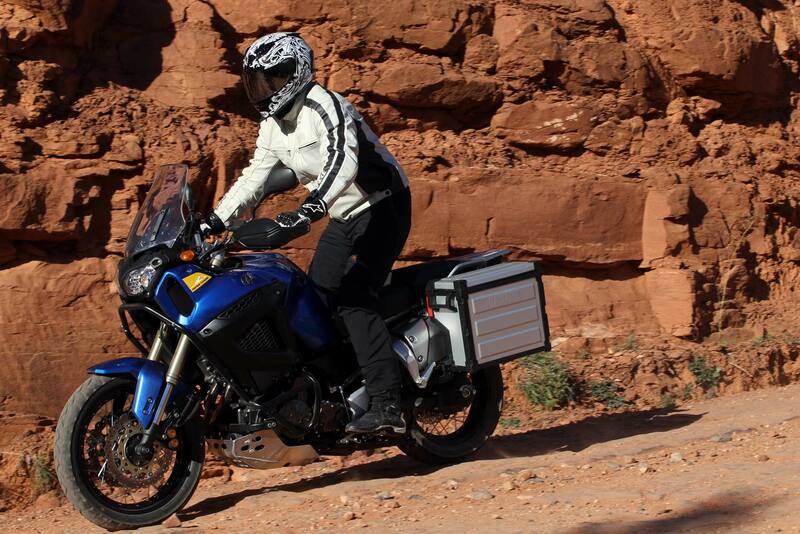 More than capable off-road than we are, and able to be pleasantly rewarding in the canyons, it was hard to give the Super Ténéré back to Yamaha at the end of our trip. 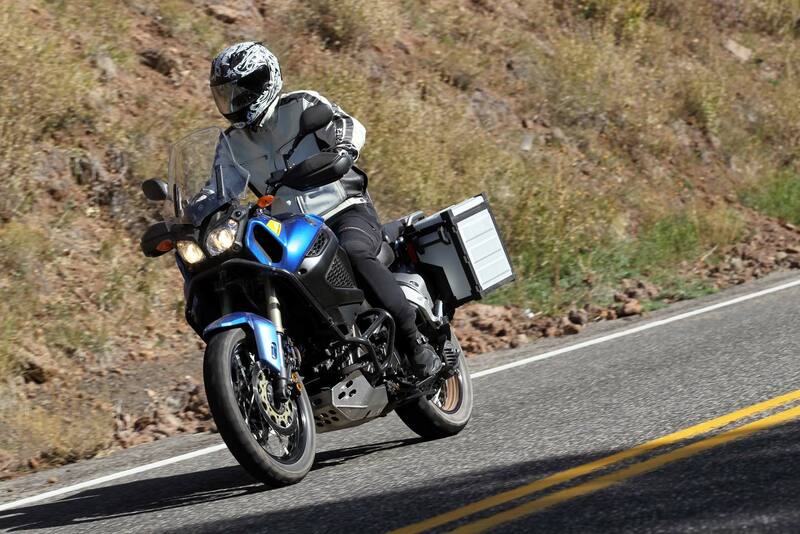 Don’t expect to see the Super Ténéré at your local Yamaha dealer anytime soon though, if at all. As was done with the V-MAX and FJR1300, Yamaha will be making the Super Ténéré only available through its Priority Delivery Program, which requires a $500 deposit by March 31, 2011. Customer orders will be filled on a first come, first served basis, with pre-orders shipping in May 2011. 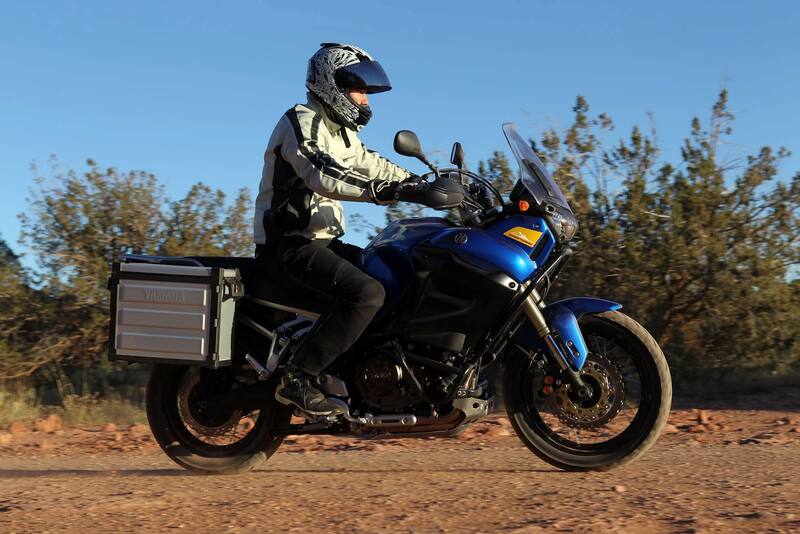 With all that the Yamaha Super Ténéré has to offer, we think the Super T is going to put a serious dent in BMW’s sales in the coming years, and that Super Ténéré owners will be very pleased with Yamaha’s crack at the adventure scene with this soon-to-be cult classic.